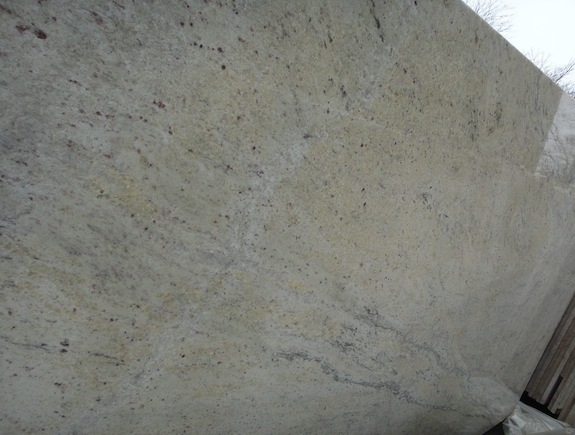 And then there was this light colored marble with golden veins – very pretty! 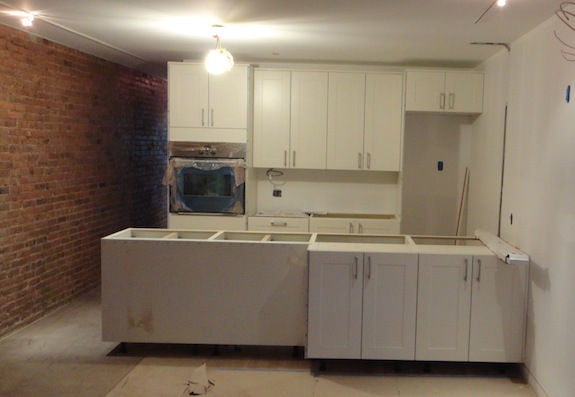 The last post was about the rental kitchen, but we’ve made progress on our kitchen as well. 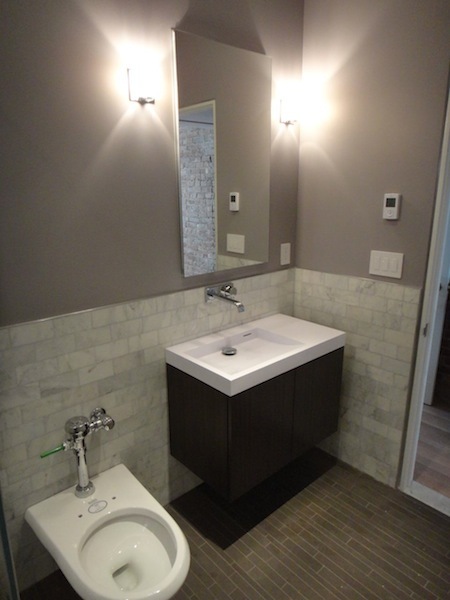 The cabinets are gray lacquer – Ikea’s Abstrakt Gray. Here’s a picture of the kitchen, but realize that most of the cabinets have a protective blue plastic on them. The only area in the picture that’s the correct color is to the left of the range, on the side of the fridge. Picking a counter material was tough. Black counters look really good against the gray cabinets, but the stairs and the range hood we picked are all about white – black would have just been wrong. A color would have complicated the design, and a busy grain would have been distracting. So we settled on Carrara since we’re using it as a reoccurring material throughout the house. 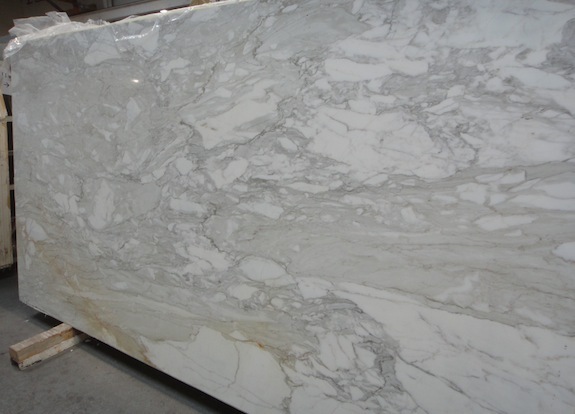 The problem with Carrara is that most of the Carrara these days is really gray. 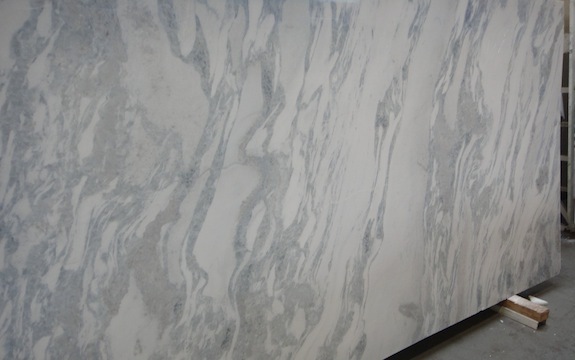 And gray Carrara next to gray cabinets would just look muddled. 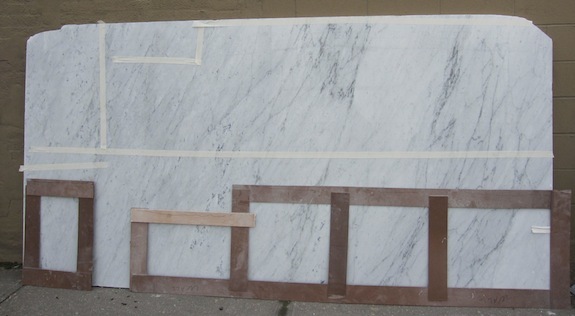 At the same time it doesn’t make sense to spend the big bucks on primo Carrara to go along with Ikea cabinets. Ikea kitchens are decent these days, but not that good. 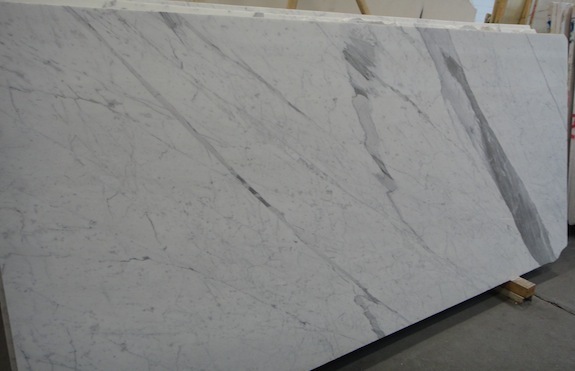 So the challenge was to find Carrara that was at a reasonable price point but still pretty white. Luckily we found some at the second stone yard we went to – but just barely. A new shipment had come in and we picked it while it was still in the shipping container – there was just one block that looked right and we only saw about 18″ of it, but when we saw it two days later it was pretty close to what we were hoping for. The template for the island is the big one to the right. 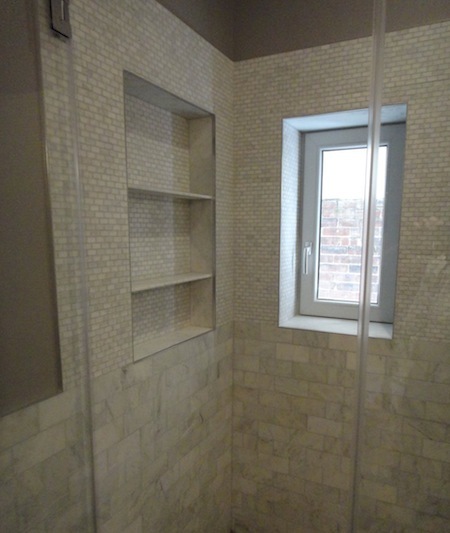 The bottom is towards the door, and you can see where the sink will be on the other side. 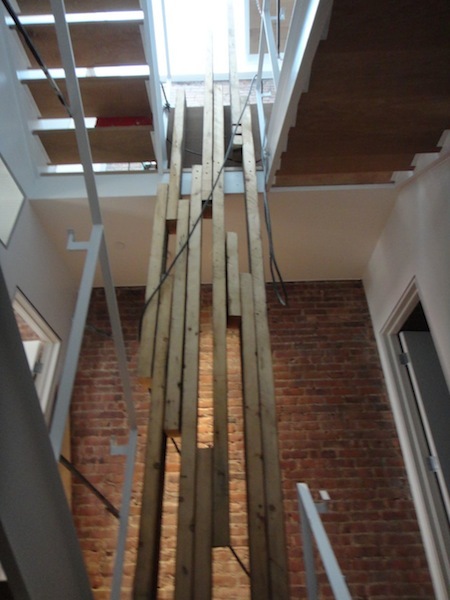 We are a little worried about the cantilever portion breaking since marble isn’t as strong as granite. Since marble is most likely to break along veins, we kept the heaviest area of veins over the dishwasher where the marble will be most supported. The veins are much less in the cantilevered area. The little template to the left will be the piece that goes under the microwave in an area that’s not too visible. 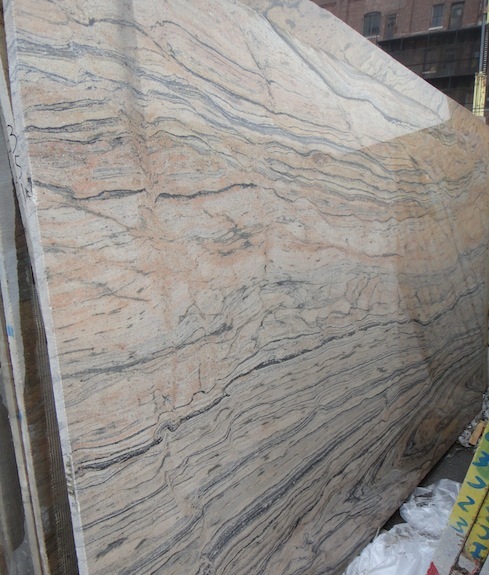 The two slabs are neighboring slices from the same block – so the veining is pretty much the same. But instead of using the bottom of the slab, like on the island, along the wall we’ll use the top part of the slab (where you see the tape). The big template will go to the right of the range, the little template will go to the left. 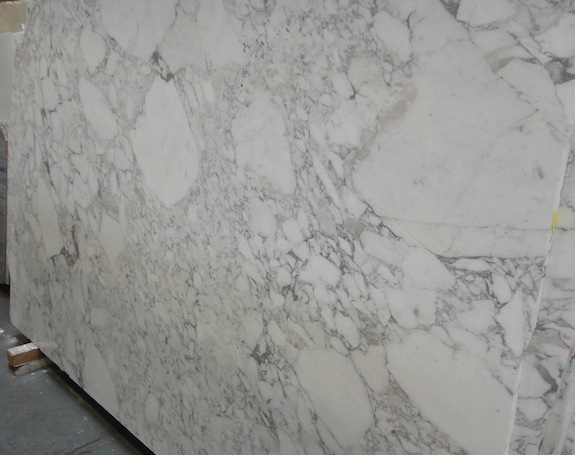 One other thing – 90% of the time people say Carrara in the kitchen should be honed, not polished. 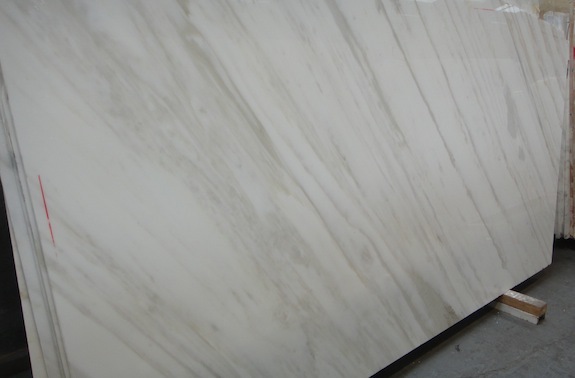 Apparently you can seal honed marble better than polished marble, and polished marble gets scratched up pretty easily in kitchens. 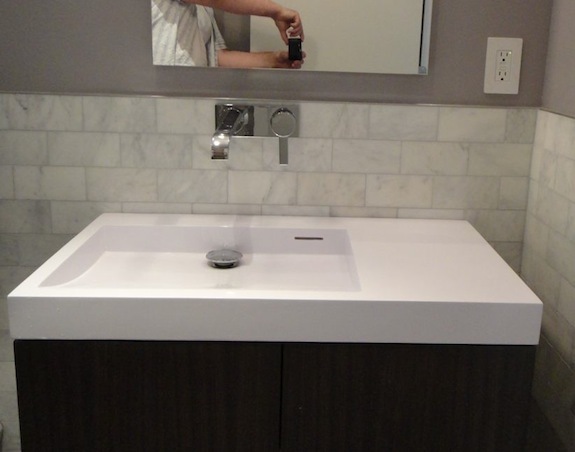 But as Dan pointed out, honed marble next to high gloss cabinets would be a bit odd. 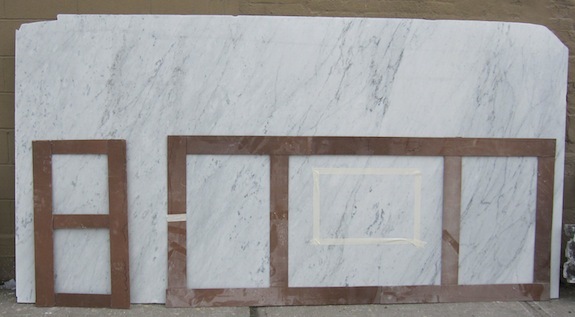 Since the cabinets are high gloss, the marble needs to be polished (visually). We’ll just have to work harder to keep it looking good. And if we hate it, apparently wiping it down with vinegar and letting the vinegar sit for 20 minutes or so will dull the polish and make it look more or less honed. 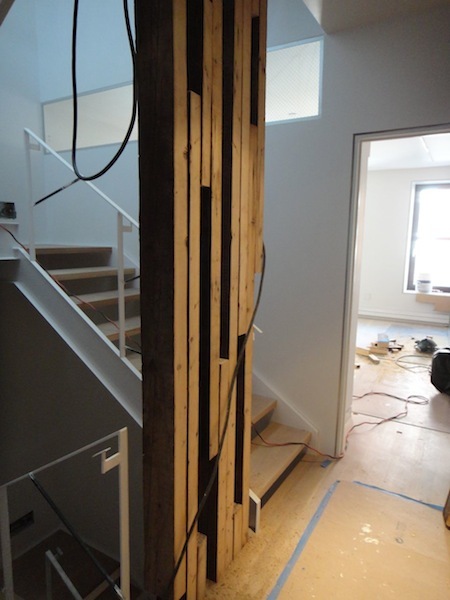 Believe it or not, the fabricator is working over the weekend on the counters and they’ll be installed on Tuesday. 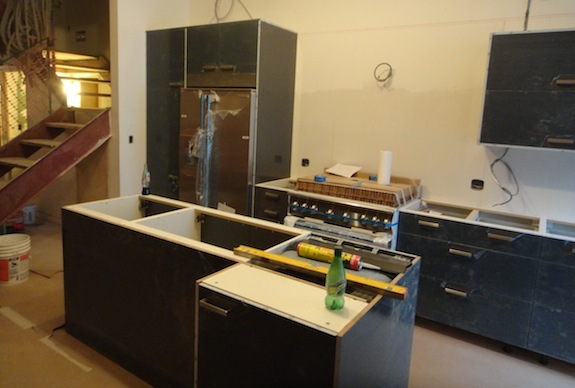 It will be great to see that final piece really come together – the kitchens will look so complete. After my post the other day we decided against Rosewood granite for the rental – it just competed too much with the brick wall. Yesterday we went back to the stone yards and looked for other options. This time we took samples of the cabinets with us and it really helped. 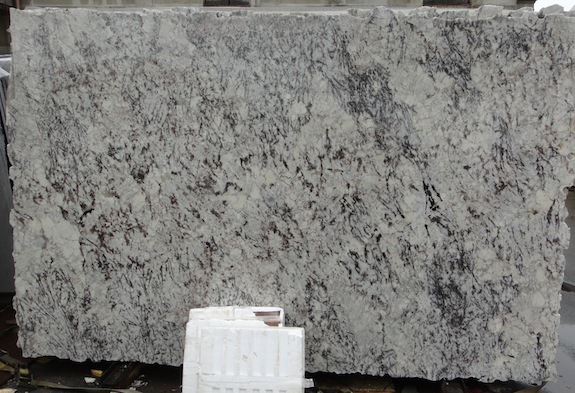 Some of the granite slabs just went better with the color of the cabinets. 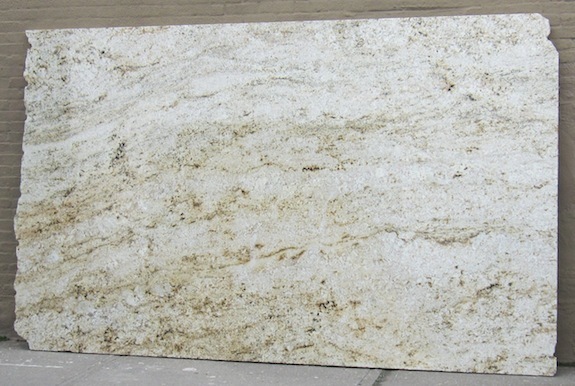 The one we chose was “Colonial Gold” granite. On the slab below the peninsula will use the lower half of the slab. It’s reversed from the picture of the kitchen below… So the darker side will be next to the sheetrocked wall and the lighter side will be next to the hallway and brick wall. There’s a slightly darker more yellow version of Colonial Gold called Colonial Creme. When we went to a different stone yard earlier in the morning they had slabs marked Colonial Creme that were as light or lighter than the Colonial Gold we bought – so the naming seems to depend on the source. 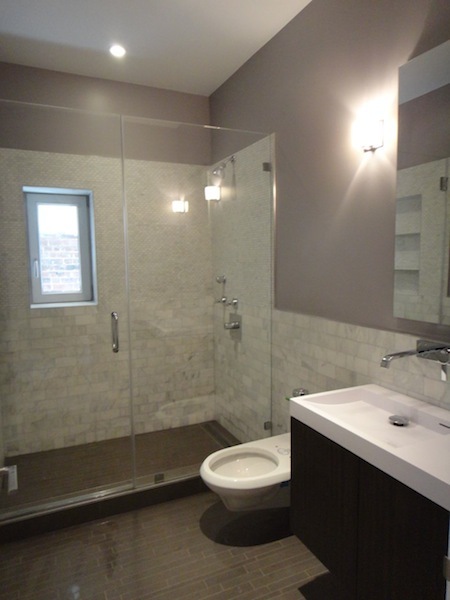 This was another that might have worked as the counter in the rental – light color with dark rust-like spots. But it didn’t work quite as well as the Colonial Gold. Today we’re off to meet the architect at the house, then we’ll go see the stone fabricator and discuss cuts so we get the most interesting bits of the slabs in most visible location. Then after that it’s back to the house for a meeting with the ironworker about the rear deck/pergola.